Now for the weekend report. We had a wonderful weekend together, and SoldierMan's last weekend here was filled almost entirely with love bomb after love bomb, just the way I wanted it. We got back from vacation after midnight Friday night. Vacation blog coming soon! Saturday morning, SoldierMan woke up early so he could go to the local gun show with some friends, a retired infantry Lt Col, an AF nurse, and a lawyer. They met early at Steve's (ret. infantry) house for "coffee." He gets there and the guys sit him down and say they want to give him a gift. Steve pulls out a Bible with a camo cover and each of them had written notes of encouragement in the front. It was very thoughtful. Then Steve says, "And while that's the most important weapon you own, we thought we'd get you another one, too." SoldierMan's words: Steve goes and pulls a gun case from behind the couch. Being a major gun collector/trader, I thought he had bought a new toy he wanted to show me - then he held it out to me. I probably stared at it for 10 seconds before I realized he was handing it to me. 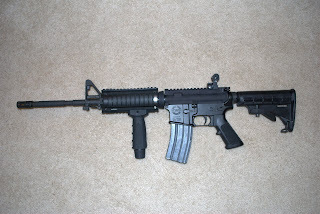 An AR-15. His dream gun. They had bought him one all his own as a going-away present. He was speechless the rest of the day. Saturday night we stayed at home. Just the two of us. And watched OU beat Kansas (depsite the refs' best efforts!). It was a good night. Sunday morning, the Sunday School group gave SoldierMan a farewell party. It was the largest group we've had in months, and nearly everyone had some words of encouragement and affirmation for SoldierMan. They had also coordinated together and every couple in the class had claimed a week to pray for him while he's at training. At the end they all prayed over him. It was really beautiful and made me even more sad to (one day) be leaving our church family. Of course, there are always some people who just can't be happy for others if it means taking the focus off of themselves. There was some drama that I won't go into detail about here, because I don't think that's what needs to be recorded for posterity. I'll just say, as with most things, it's amazing how you can get tons of love and support in places you don't expect them, and then not in the places you do. I'm still a little bitter about it, mostly because my husband was treated in a manner less than that of which he is worthy. But in the end, it's the other person's problem, not mine. 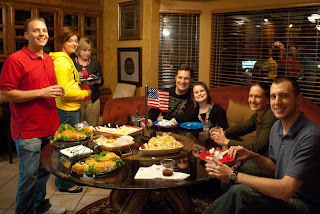 Then Sunday night was the big farewell party. And I mean BIG - nearly 80 people came in all! That boy is loved far beyond what he realizes. 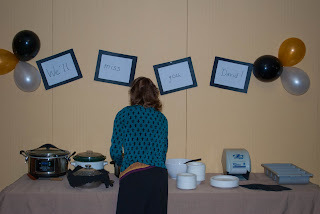 When we (his mom, my mom and me) first came up with the idea of a farewell party, he honestly didn't expect anyone but immediate family and a couple of friends to show up. And he got a huge Oklahoma-sized love bomb instead. It's always great seeing someone you love being loved on. 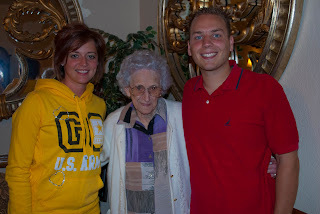 My 96-year-old grandmother made the trip over to say goodbye. This is epic since nowadays she only has the energy to leave the house to go to church once a week. 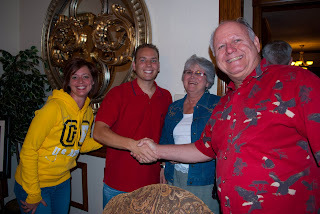 All in all, we had a great weekend with family and friends. Sounds wonderful! and... you got the sweatshirt!!! I'm jealous!! You got the sweatshirt! I LOVE it! i want the marine corps version of that sweatshirt if only they had one! Wow... the story of everyone taking weeks to pray for him really touched me. It helps so much to have a group of support like that. AND I'm going to need to know where you got that sweatshirt! Your hubby is going to do wonderful! I am so very thankful that you both have such an amazing support group and are so involved with your church! :) The time will fly by and you will be together again before you know it! As for your hubby's ring, we went to Wal-Mart and bought my husband a cheap-o ring for him to wear during his training and keep the nicer one at home. Just a thought...Let me know if you need anything! Ok so I was actually brough to tears at the thoughtfulness of your community towards your husband! That is what a soldier deserves! Praying hard! First of all, totally jealous of that sweatshirt. Second and more importantly what a touching send off weekend you all had...it's so great to be supported by so many in prayer and add me to that list I am praying for you both! You and your husband have wonderful friends and family. Whoever started the drama is beyond jealous! !